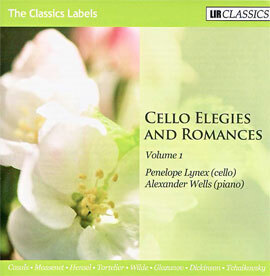 Cello Elegies and Romances is a 2-CD anthology of interesting works for cello and piano which the artists were keen to record. Some are relatively unknown, some première recordings, others are cellists' favourites and two are dedicated to Penelope Lynex. Download all audio samples for Vol.1 here (one 10MB ZIP file), or individually below. Download all audio samples for Vol.2 here (one 12.5MB ZIP file), or individually below.